Let me explain something to you, dear reader. I’m retired. That means that one of the first things I do when I wake up in the morning is ask myself, What day is it? Lucky for me my computer tells me what day of the week it is, or else I’d be lost in a total time warp. One day is the same as the next for me. Every day is a day off. So this morning, when I realized it was Wednesday, I knew I had to write a blog post. What point is there in joining WIP Wednesday if I forget to post something on Wednesday, right? So here is where my WIP stand today. I have completed a few more rounds on the second Show-Off Stranded (not stranded) sock, so there’s no point in taking a new picture because it won’t look any different from the previous picture. I don’t know whether The Spider Queen still counts as a WIP because she isn’t blocked yet. I think not. The knitting is done, and she doesn’t need any making up, so in my not so humble opinion, she’s a finished object. So that leaves me with a spinning project. I started working on a lovely braid of BFL and Sparkle from Woolgatherings. The colors are brilliant, and I am really enjoying spinning the sparkly yarn. The Sparkle Nylon is soft and isn’t even noticeable aside from the sparkle. 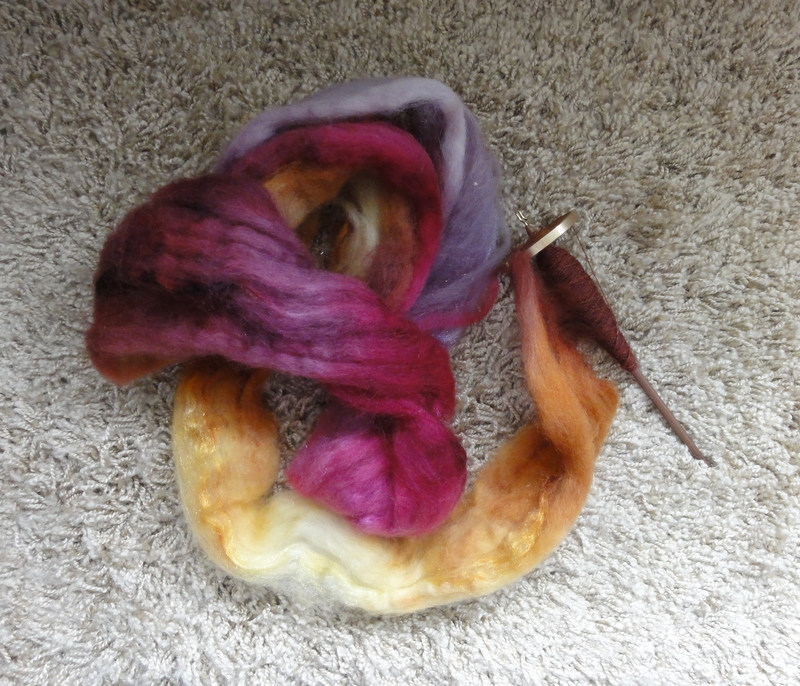 I’m spinning this yarn very fine and planning to chain-ply it to make a sock yarn. But I have a long, long way to go before this project is completed. Stay tuned to the channel all week because I will definitely have a report for you on FO Friday. This entry was posted in Knitting, Socks, Spinning and tagged BFL/Sparkle roving, Show-Off Stranded Sock, The Spider Queen Shawl, WIP Wednesday. Bookmark the permalink. Such rich fiber colors! I look forward to watching your spinning progress. Thanks, Janet. The colors are even richer when spun, and the Sparkle Nylon is awesome! Woohoo! That looks like some good fluff right there! I love the colors! And your spinning is divine!